It is no secret that I am some what of a nerd. I have written about all kinds of nerdy fandoms here and on other blogs that would further cement this fact. Instead of my normal rambling on about what game I am currently obsessed with, I thought I would put together a handy list of geekery that I am either watching, playing, working on, etc. 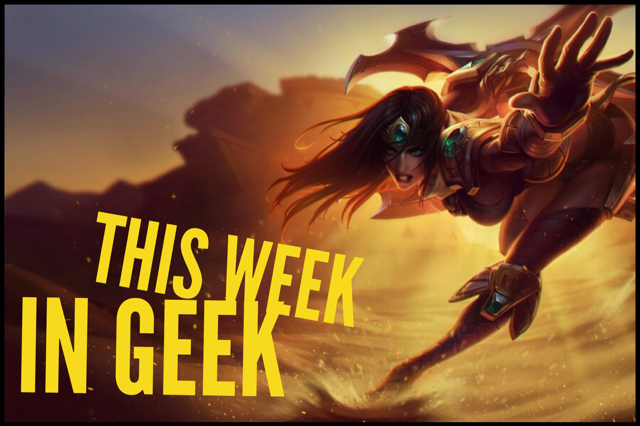 – I’ll be the first to admit that I’m a little late to the League of Legends hype. I recently started playing (within the last two months) and I am really enjoying it. Currently I am learning to master a few champions – Ashe, Sivir, Morgana, and Katarina. So far I really detest playing anything that does not have any sort of ranged attack. You can find me on League as pyropixieshesaid. I can’t wait to hit level 20 so that I can unlock tier 3 runes. – If you haven’t heard of Hero Siege, please open your Steam client and download it right now (it’s only 5.99!). This pixellated hack and slash is crazy addicting and a really fun multiplayer. It is still being developed so there are days where the game is just insanely glitchy, but for the most part its a great way to burn some of your free time. I am currently rocking a level 82 Pyromancer and have only been playing for 3 days. You can find me on Steam as pyropixie. – There are a couple of apps that I am currently obsessed with on my phone. The first being Disney Gif. This operates similar to the emjoi keyboard in that you download the app and then install it as a keyboard. It allows you to send pre-made Disney Gifs in text messages to your friends. The second app that I am really loving is called LegendSmith. It allows you to view top builds for League of Legend characters as well as create builds to see how they would stack up in game. It’s come in pretty handy and I find it interesting to see what items people build on various characters that I play. – I recently started using my Razer Naga that I received for my birthday back in March and I am really loving it. Having the programmable hot keys on the side of the mouse really comes in handy in League (gosh can I talk about League a little more?) and the size is not overwhelming for my small hands. I have the neon green version (and the neon green Razer headphones to match). – Lastly how cute is this Animal Crossing Stationary!? Too bad I would never want to use it because its so adorable! I hope everyone has a happy and safe 4th of July – I’m off to set $200 on fire set off some fireworks! Super Nerd. Internet fanatic. Blogger. Crafter. Photographer. Dreamer. Cat Lover. Music Enthusiast. California Girl. Grab a beverage and stay a while. Oh! and don't forget to introduce yourself - because if you don't, that's just creepy.